There are also a couple of useful downloads (links are to the English versions, they are available in other languages): Bicycle and train is a pretty compre­hensive guide with a map of 'self-loading locations'. sometimes you see both picto­grams - this means that the service takes bikes, but you need a reser­vation, and you can't load it yourself (no I don't know how that works exactly). Like the bahn.com website, the sbb.ch: online timetable has an advanced search facility that lets you search only for trains that carry bikes. 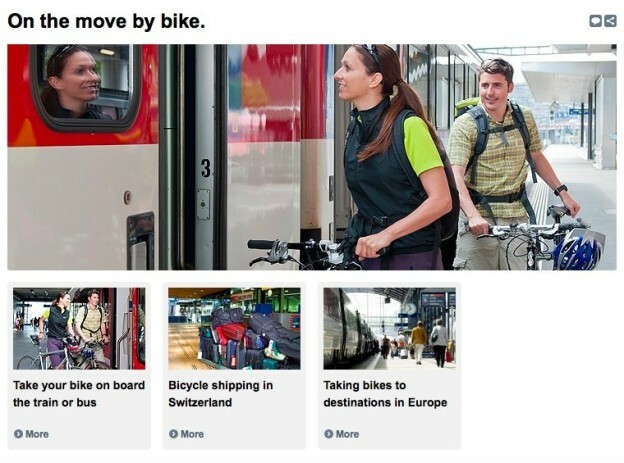 However, note the words 'Switzerland-only', this feature will exclude inter­na­tional trains with with bike carriage facil­ities because these can't be used for journeys within Switzerland. I'm planning to travel through Switzerland on my way to Italy this year. I booked my ticket and bike place with the voyages-sncf.com call centre in the UK and rang the Swiss Travel Centre - only to find that the booking window for Swiss Railways tickets is two months. To make things even more confusing, so far as I can tell you can only book tickets online one month ahead. the good news is that you can buy bike tickets online. (I'll update this when I've booked my tickets.